Sprouts are a delicious alternative to expensive bottles of vitamins which can lose their nutritional value as well as expire within a year of it being purchased. In fact, sprouts provide the highest amount of vitamins, minerals, proteins and enzymes of any of food per unit of calorie. Enzymes are important because they heal the body, cleanse the body, prevent diseases, enhance general functioning of bodily organs, aid in digestion, and remove gas from the stomach. Once a seed has germinated, it begins to sprout. Within these sprouts contains vitamins A, B, C and E, and K, as well as, Calcium, Potassium, Zinc, Chlorophyll, amino acids, and up to 35% protein. Inside these small biogenic (living) foods lies essential nutrients and vitamins that can assist in providing a good portion one’s daily requirement of nutrients. Sprouts can grow anywhere, during any season, and require minimal work. 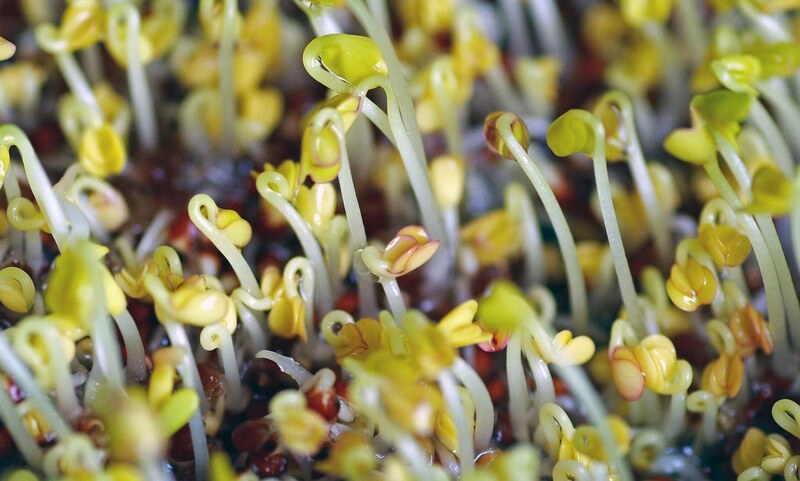 The most common types of seeds to sprout include alfalfa, fenugreek, peas, lentils, radish, broccoli, cabbage, mustard seed, garbanzos, quinoa and red clover. However, many people sprout grains, nuts, and an assortment of beans as well. Because raw foods have been known to carry traces of salmonella and e. coli, it is suggested to use organic seeds or untreated seeds since these type of seeds have no traces of insecticides and have been handled in a way that minimizes contamination. Additionally, persons that have compromised immune systems or those that are very young should avoid raw sprouts. It is best not to use seeds from the nightshade family, such as tomato, eggplant, cayenne, ground cherry, paprika, potato, sweet pepper. They can cause serious illness. However, any other type of seed is fine. They can be cooked or eaten raw, and can easily be incorporated into one’s diet.